It’s no secret that I’ve been a huge fan of eBay since the beginning of my collecting days. I truly believe eBay was one of the reasons why I got into antique and vintage jewelry, as it was the first outlet I was able to explore this newfound category I fell in love with back in 2007. My hometown had one little watch shop, where I first found the antique filigree ring of my dreams and learned that this ring was actually an “antique.” Typically, a passion could begin and end quickly if there is no place to foster a new love. Luckily this all occurred during a time when the Internet was growing rapidly and eBay was a hotspot for collectors of all sorts of items. I remember browsing the Fine Jewelry category for hours upon hours. With each click and each bid, my passion grew more and more…I was also teaching myself and becoming a discerning collector. One of the first things I ever bought on eBay was some gold-filled lockets. I talk more in depth about this here, but this was how I learned to bid and I started with gold-filled lockets that were around $10-$30. I was in high school at the time, so this was an ideal intro to bidding and collecting via eBay. As I transitioned into fine jewelry, one of my first purchases from eBay was a champagne diamond from a seller based in Africa. I remember staying up late to be awake for the auction to end, and my mom questioning me why I was still awake on the computer. I had just graduated from college and was living with my parents, so I wasn’t about to lie to them. I told my mom I was bidding on a diamond from Africa on eBay and of course, got the full range of emotions, doubts and the “what are you doing with your life” comments. I, on the other hand, felt fully confident with eBay and knew if this weren’t really a diamond, that I would be alright in the end. I came out a winning bidder that night and still have that champagne diamond — which is, in fact, a real diamond…and it now sits in a beautiful ring that I got custom made for me. 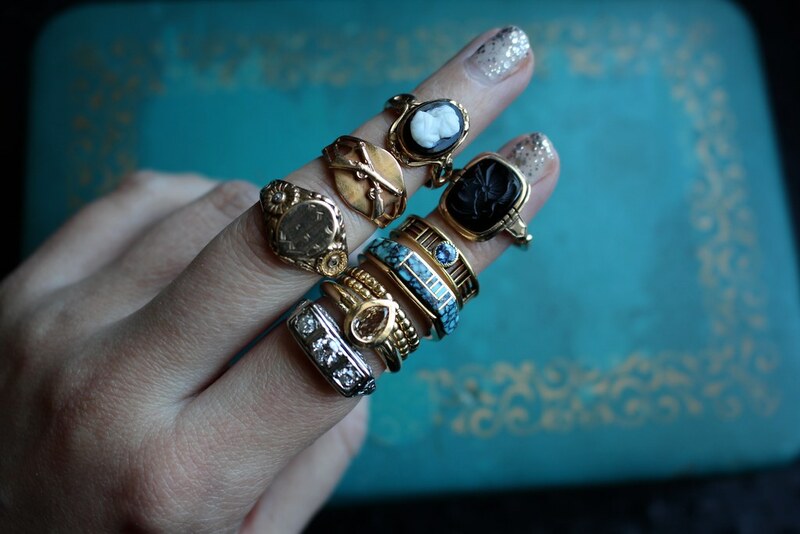 Most of my entire antique baby ring collection is actually from eBay! They are pretty hard to find and most dealers won’t give baby rings the time of day, as they have bigger pieces to focus on, so hunting for baby rings on eBay is one of my favorite pastimes. It is also my husband’s favorite gift to buy me, as he searches every Christmas for a unique baby ring from eBay for me as a stocking stuffer. He has gotten really good at it! And I love that he found it all on his own–it makes it more special. I love how eBay is a virtual flea market; you never know what you’ll come across. That’s what keeps me coming back and checking on a daily basis! Some of my favorite pieces have come from eBay. 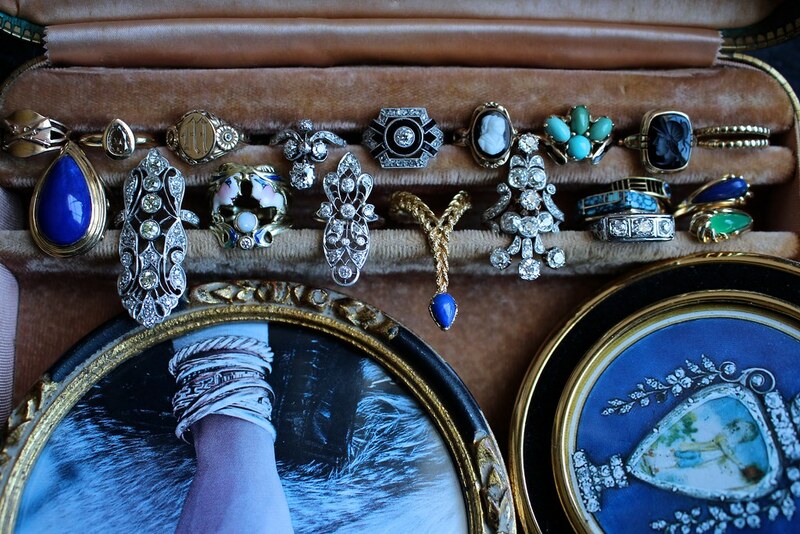 It was fun to go through my entire jewelry box and pull out every piece I ever bought from eBay (pictured above). I’ve boughten several pieces over the years that I’ve sold as well, so these are the tried and true favorites that stuck with me after all these years. Some of my most important categories started with eBay — like the diamond elongated rings. I bought two of my very first and most loved Edwardian diamond rings from eBay. Also my date ring collection was grown thanks to eBay. Finding the dates I had missing from my collection was hard to do via flea market hunting and going to jewelry shows, so I was constantly searching on eBay to see if any would pop up in a saved search. Sure enough in the very beginning of my collection, when other people didn’t collect them yet, I was finding a bunch! Now they are definitely harder to find (and a lot more expensive) as they’ve gotten more popular once I shared my entire collection. 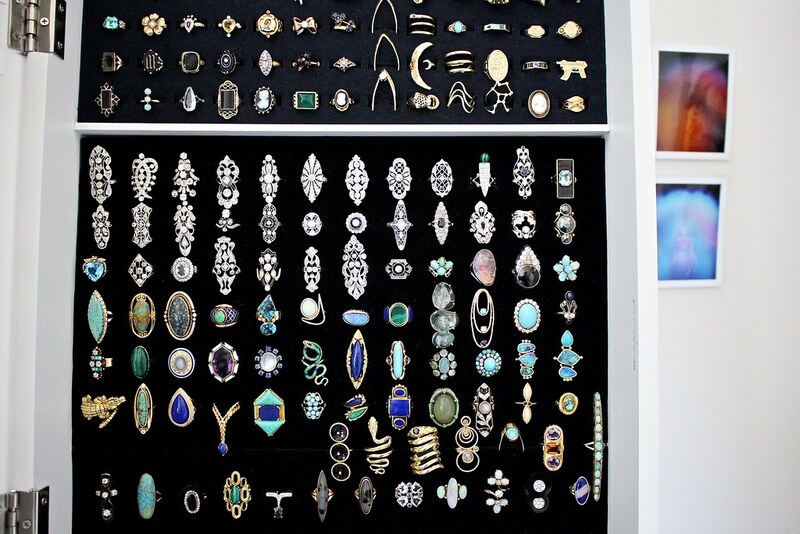 Whether you use eBay regularly like me to grow your antique jewelry collection or have never used it at all, these tips will come in handy. I’ve been a member of eBay since 2005 and have bid/purchased items on there ranging from fine jewelry to home decor, to antique jewelry boxes and holiday decor, rare and retired toys, and gifts. 1 — Use “Saved Search” to your advantage: are there certain wish list items you’re always on the hunt for? Is there a specific style of jewelry you collect? Save some keyword searches and have eBay do the hunting for you by sending you an email when new items are listed that match those keywords! 2 — Use those eBay Bucks: for me, especially around the holidays when I buy the most from eBay, I’m earning eBay Bucks with every purchase and I make sure I use them once they become available. I’ve gotten items completely free because my eBay Bucks added up! 3 — Don’t be afraid to Make An Offer: I’ve gotten lucky with the Make An Offer feature and I highly recommend to take full advantage of it! What do you have to lose?! 4 — Search within your favorite category and “Ending Soonest”: I find the Vintage & Antique Jewelry category and narrow it down to just the “Fine” section…then search starting with the items ending soonest. You can sometimes find some steals that non one has come across that are about to end with a very low bid. 5 — Search out the best Sellers: no matter what you collect, searching out the top-rated and most unique sellers within your target category and then saving them is a must! There are moments where I am short on time and can’t search by category through thousands of items, so I go to my favorite sellers list and start there! Be sure to share some of your favorite items you’ve purchased through eBay and tag me on Instagram, I’d love to see! PS: Here is a link to eBay’s current jewelry promotion featuring some of their top antique & estate sellers auctioning off items that all start at just $0.99. This sponsored blog post was brought to you in collaboration with eBay. ebay bucks no longer save from month to month. and they have lowered how much you get from purchases. and lately, a lot of ignorant sellers claiming things are victorian or deco but are clearly repros!